In 1889, Colorado’s mining boom netted significant deposits for Telluride’s San Miguel National Bank—so much so that Butch Cassidy and his “Hole in the Wall” gang paid a visit, riding off with $30,000 in their very first bank robbery. Today the riches can be measured in the fairways and greens of the semi-private golf course. 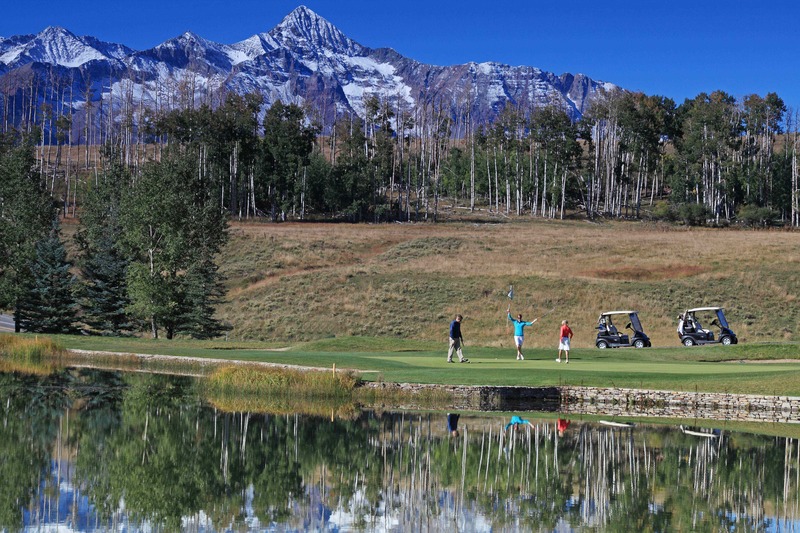 Designed by the Telluride Ski & Golf Club, the 18-hole layout opened for play in 1992, and is distinguished by its fir and aspen forests, wetlands and gently rolling fairways. Woven into Turkey Creek Mesa, the course is at an elevation of 9,564 feet and provides golfers with “glad-I-brought-my-iPhone” views of Mt. Wilson, the San Sophia Range and the Sneffels Range. Four sets of tee boxes have the course playing 4,542 yards at its shortest and 6,574 yards from the tips. The front nine tests your skills on a trio of par 3s, three par 4s and three par 5s. Rated the third hardest the par 5 eighth hole plays 627 from the tips. Three par 3s, five par 4s and a par 5 challenge you on the back nine. Playing 491 yards the par 5 12th hole tests your skills on the back. The course is a 12-minute gondola ride or a 20-minute drive from the town of Telluride to Mountain Village. Greens fees mid-May to mid-October for 18 holes range from $85 to $210, including a cart. Stay & Play package guests at The Peaks and The Inn at Lost Creek enjoy preferred tee times and lower rates over public play. 970-728-2606. Designed by Ken Dye, Dalton Ranch Golf Club is a semi-private course located in Durango in the Animas River Valley. Opened in 1993, the par 72 layout has been called “The Sparkling Jewel” of the Four Corners. In addition to the stands of towering pines and red cliffs of the San Juan Mountains, the “American-links” style course captures your attention with water on all but one hole (number 8). Four sets of tee boxes have the course playing 5,539 yards at its shortest and 7,007 yards from the tips. The front nine tests your skills on a pair of par 3s, five par 4s and two par 5s. The course’s number one handicap, the par 5 fourth hole, plays 558 from the tips. Two par 3s, five par 4s and two par 5s challenge you on the back nine. Playing 566 yards the par 5 13th hole puts your skills to the test on the back nine. Water comes into play in earnest on 6, 7, 9 on the front and 10, 12, 13, 14 and 15 on the back. The course doesn’t offer Stay & Play packages and, while members enjoy preferred tee times (Friday – Sunday before 10:30), guests find plenty of opportunities to tee up. Greens fees mid-May to late October/early November for 18 holes range from $60 to $120, including a cart (though walking is an option). New this season is Elevated Golf Academy, which offers one-on-one, couples and group lessons, as well as club fitting. 970-247-8774. One glimpse at the gorgeous course at The Club at Crested Butte and you understand the allure. Designed by Robert Trent Jones, Jr. its strategically placed water hazards, cloverleaf bunkers, multi-tiered greens and intriguing layout challenge experienced players with risk-reward holes, yet give the casual golfer a friendly design that invites return play. Standing on the first tee, you start your round admiring postcard vistas of Mt. Crested Butte, Mount Bellview, Mount Baldy and the Elk Mountains. Stands of pine and aspen forest, sweeping meadows, and the Slate River, which meanders along several holes, underscore the area’s natural attractions. Five sets of tee boxes have the course playing 5,004 yards at its shortest and 7,155 yards from the tips. The front nine tests your skills on two par 3s, five par 4s and two par 5s. The course’s number one handicap, the par 4 eighth hole, plays 432 from the tips. Two par 3s, five par 4s and two par 5s challenge you on the back nine. Playing 633 yards the par 5 13th hole gives you pause on the back nine. With over 80 bunkers, water that comes into play on 14 holes, sagebrush roughs, heaving and pitching fairways, tricky pin placements and modest greens, the course looks intimidating, but the Scottish links-style layout only flexes its muscles every so often. Members gets dibs on preferred tee times, but the public can tee up from noon on. Greens fees late-May to early October for 18 holes range from $75 to $159, including a cart; 9 hole rates are less. Golfers save up to 40% with select Stay & Play packages at the Elevation Hotel & Spa. 970-349-8603. 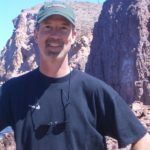 Mind Games: Mountain courses often have natural hazards such as rock outcroppings, ravines and streams, as well as forced carries over native grasses and wetland areas. Elevation changes can also be extreme. Given those steep drops or inclines, you’ll have greater changes in distances: a 200-yard shot plays a lot longer uphill and conversely a lot shorter running downhill. Green Reading 101: Note that, once on the putting surface, the slope of the green typically runs away from the mountain peaks. So, if the mountain is to your right as you putt, and the cup is below you, there’s a good chance the ball will break right. If you are playing a course for the first time, check with the pro shop about how to best manage play. Summer and Fall: Though some mountain courses open in April, the season is best from late June through mid-September. Arguably, the most picturesque time is mid- to late September when the aspen trees are changing color, dustings of snow clings to mountain peaks and the air is crisp. Most mountain courses close between early and late-October. Bridges at Black Canyon, Montrose: Semi-private with public play. 18 holes. Greens fees late-March to early November for 18 holes range from $49 to $69, including cart; Walking, Twilight and 9 hole rates are less. (www.montrosebridges.com/). Tee times: 970-252-1119. Divide Ranch & Club, Ridgway: Semi-private w public play. 18 holes. Greens fees late-May to early October for 18 holes range from $29 to $55, plus cart fee of $20 pp; 9 hole rates are less. (http://divideranchandclub.com/). Tee times: 970-626-5284. Glacier Club, Durango: Semi-private w limited resort guest play. Play limited to 18 holes on The Valley course. Resort guests staying in The Lodge at Tamarron can tee up mid-May to mid-October. (www.theglacierclub.com/) Lodging and rates: 970-382-7851. Redlands Mesa, Grand Junction: Public. 18 holes. Greens fees early April to early October for 18 holes range from $50 to $70, including cart; 9 hole rates are less. (www.redlandsmesa.com/). Tee times: 970-263-9270.